Soooo.. the beginning of this year has gotten the best of me. We started back at school on August 5 (a CRIME I tell ya!) and it was just waaaay to early... for ALL of us! Kids wanted to be outside playing..and frankly, so did I! Ha! This year, my class is awesome! I mean... BEYOND awesome! I'd say, BEST class in my 14 yr teaching career....so far. So HOW did this year just work me over? Wellllll, have a seat, Friend. About 3 weeks before school began, my principal informed me that I was going to have a 2/3 combo class. I teach 2nd grade and have taught 3rd so it was no problemo. Fast forward about 1 1/2 wks before school starts and the numbers change and my principal contacted me and told me that I now have a 1/2 combo. I was like, "AHHHHHH!!!" You see, the last time I taught 1st grade... I cried.....EV.ER.Y.DAY! I mean, I went from teaching 3rd to 1st and I was like, "Why can't you sit in your seat?" and "Why can't you write your name or hold a pencil?" Needless to say, I was a *bit* nervous to teach these little ones again. PLUS, my job sharing partner was on maternity leave so I had a long term sub ...who was AWESOME, by the way! But still... I had to learn a new curriculum for 1st grade and learn a new math one in 2nd grade, AND then teach it to my sub..while I still didn't have it all together myself....but only being there 3 days a week. It was interesting. Well, my job sharing partner finally came back and now all is well again. :) PLUS, my kids SERIOUSLY ROCK!!!! At my school, combo classes get all the great kids because they have to be super independent and be able to grasp concepts quickly. I big puffy heart them so far! OK, so I wanted to introduce you to my latest unit. We are using Houghton Mifflin for our language arts curriculum, which is not common core aligned. 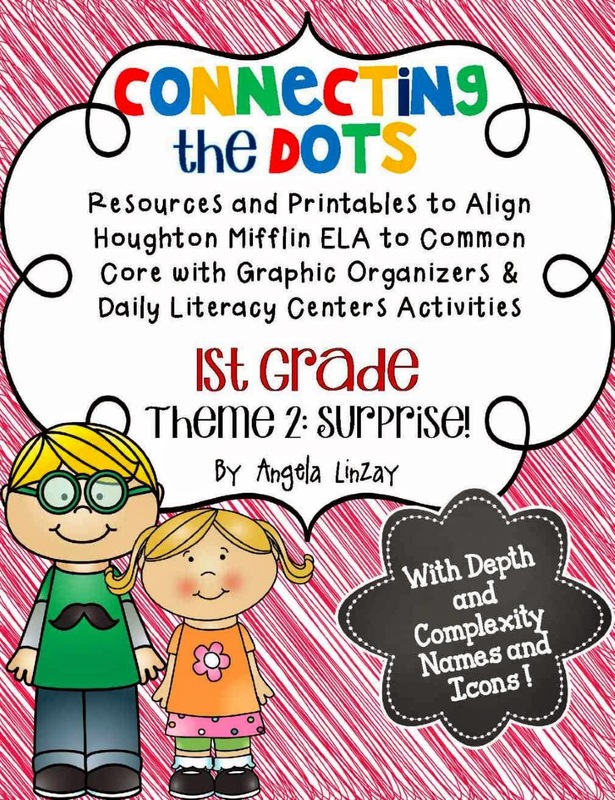 Last year I created resources to align all our 2nd grade HM curriculum to the Common Core. Other teachers had asked me to do it for other grade levels and I really had no intention of doing that since each theme took me HOURS and HOURS to create (over 250+ pages for each theme!) Since I now teach a 1/2 combo, I thought it would be fitting to create them for 1st grade. I started with Theme 2 since I couldn't get Theme 1 out in time. 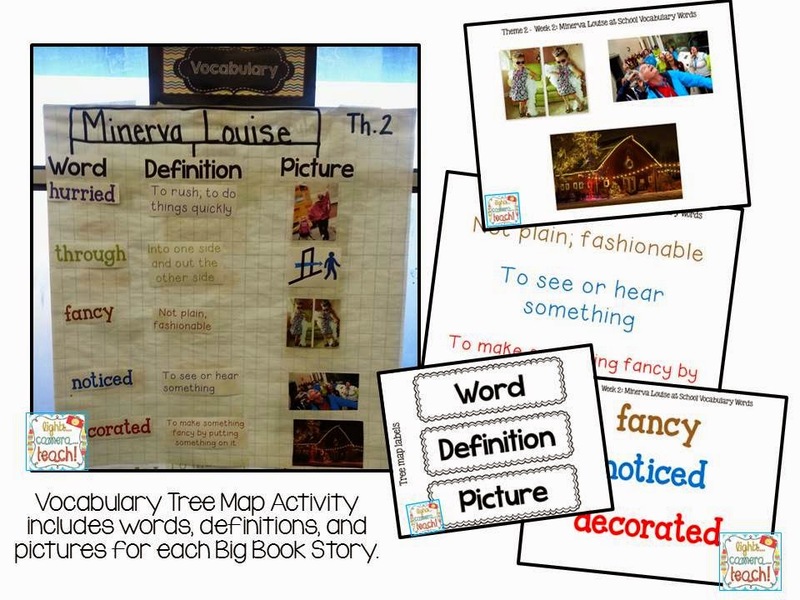 There are also vocabulary cards with real pictures for your focus wall. Differentiated Thinking Map with 2 levels. Level 2 asks for text dependent answers. I've included teacher "cheat sheets". Every week ends with an opinion writing that ties into their story and a Making Connections activity where students connect the text to themselves, other texts, or the world around them. This unit is on sale until tomorrow night (Thursday). So go grab it....NOW!!! Is there any chance you will be selling Theme 3 any time soon? I also have a 1/2 combo and I love your second grade stuff, but my first graders are already on theme 3. I am teaching a 1/2 combo this year, too!! :) Hopefully you are surviving.